Visit four of Cairo’s star attractions and explore Old Cairo on this full-day tour, including lunch, with an Egyptologist guide. Visit the Egyptian Museum to see Tutankhamun’s funerary mask and more; and view the Mosque of Mohamed Ali, otherwise called the Alabaster Mosque. Delve into the ancient lanes of Old Cairo to see the famous Hanging Church, other Coptic churches and the Synagogue of Ben Ezra. 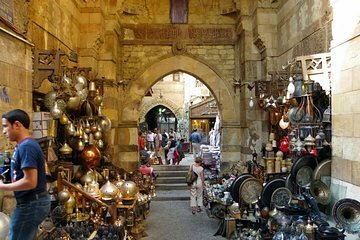 Finish at the Khan el-Khalili bazaar, Cairo’s old souk, with free time to explore the narrow alleyways and shop for handicrafts, jewelry and trinkets.